The last time we heard these 29 motets drawn from the Hebrew Songs of Songs (Fanfare 30: 2), there were 11 versions to account for, the first two incomplete on a single LP and the next two complete but never issued on CD. Of the rest, the seven CD issues are mostly complete on one disc, although one of the best of all, the Hilliard Ensemble on Virgin, is now available as two discs for one at midprice. The most recent review found that Livio Picotti’s group was all-male like Bruno Turner’s Pro Cantione Antiqua (another very fine version with instructive notes), very fast like John Rutter’s Cambridge Singers, and accompanied by lute and organ like no other. Now we have a different approach to the work, one not considered before. Since texts from the Song of Songs were used in many liturgical chants, especially for antiphons in Offices of the Blessed Virgin and the common of virgins, Venanz Schubert has chosen a chant (almost always an antiphon) to precede each motet, supposedly one related to its motet. The antiphon is first sung solo, then repeated by the choir. I’m not sure how this enhances the main work, for only a few antiphons are textually identical to their following motets; others have a phrase or two in common, and many are unrelated other than by their origin in the same Biblical book. 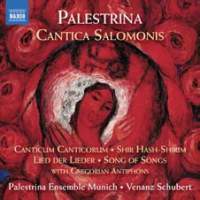 The Palestrina motets are sung with lovely tone but without the strength and balance of parts that characterize the Hilliard and several other fine versions. The chants are sung in a traditional Solesmes rhythm with a curious pause in the middle of each antiphon. The second disc is filled out with a motet from the 1593 collection of offertories, Afferentur Regi virgines post eam (a first recording), and one from the 1569 Book I, Quam pulchri sunt. The former is preceded by a tract on the same text and the latter by a gradual totally unrelated to the other text. For some reason, most of the second disc was recorded last year, but the rest of the set was made seven years earlier. Given the span of time, only one of the basses sang in both sessions. The eight-voice ensemble is made up of university students in Munich, and the conductor was a member of Capella Antiqua München. The result of their efforts can give considerable enlightenment, but it does not match the Song of Songs of the Hilliard Ensemble or Pro Cantione Antiqua.